M/Y Blue Melody is the third vessel in the blue o two fleet and underwent a complete interior re-fit in 2008, followed by an update in early 2016. The aim of 'Project Shark' is to highlight the global issues facing sharks, with a Red Sea focus, as well as enjoying some of the most spectacular reefs that the Red Sea has to offer. Learn about the biology and behaviour of sharks within the Red Sea with nightly lectures from a representative of the "Red Sea Sharks" trust. Founded by our expert dive guide and marine biologist, Elke Bojanowski Ph.D, in her quest to track and collect basic population data on oceanic whitetip sharks (Carcharhinus Longimanus), in the Egyptian Red Sea. Elke began the Longimanus Project in October 2004 and since this date she has been actively collecting underwater photographs and video-clips of Oceanic Whitetip Sharks for catalogue, review and analysis. Since 2012 the project has expanded to become Red Sea Sharks (www.redseasharks.org) and increased its scope to include Grey Reef and Silky Shark catalogues and monitoring for many shark species. Visit dive sites local to your departure port for three dives (a check dive, practice zodiac dive and night dive) before heading out to the marine parks. We normally plan to spend a day each at Big Brother, Small Brother, Daedalus and the Elphinstone area. Normally you will have the opportunity to make three dives per day (night dives are not permitted in the marine parks). Please note that this itinerary will only spend one day at the Brothers if sailing either to or from Port Ghalib. After a week of drop-offs, enjoy two relaxed morning dives local to your arrival port allowing you to cruise into harbour in the early afternoon. Take advantage of an evening onshore to purchase souvenirs and enjoy Egypt's famous hospitality before your journey home the next day. The itinerary above is an example of the planned route and dive sites cannot be guaranteed. All dive sites are subject to weather conditions and the final route taken is at the absolute discretion of the captain and dive guides. 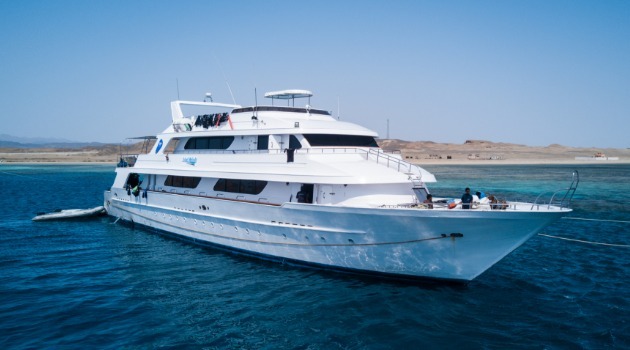 This itinerary can depart from and arrive to either Port Ghalib or Hurghada, which will influence the order of the itinerary and the dive sites available at the start and end of the week. Please note that ports are subject to change.